Frey Farms CEO Sarah Frey grew her family’s single farm in southern Illinois into a national supplier of produce, with more than a dozen farms and facilities located throughout the Midwest and Southeast. 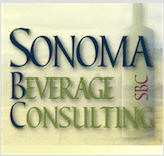 Now the company is continuing to build its beverage division — which already includes Tsamma Watermelon Juice and craft private label provider Fresh pour — with a new line of better-for-you drinks, Sarah’s Homegrown. The company launched Sarah’s Homegrown Agua Frescas, a line of frozen juice drink mixes, this month in Walmart nationwide. The blended juices are made from fresh produce, including fruits grown and squeezed on the company’s farms. The new line includes Watermelon Cucumber, Strawberry Lemon, Mint Lime Mojito, Mango Pineapple, and Pina Colada varieties packaged in multiserve pouches and will retail for $4.98 per six-serving package. Frey Farms began building its beverage division six years ago when the company opened a private label beverage production unit that partners with retailers, distributors, and chain restaurants. 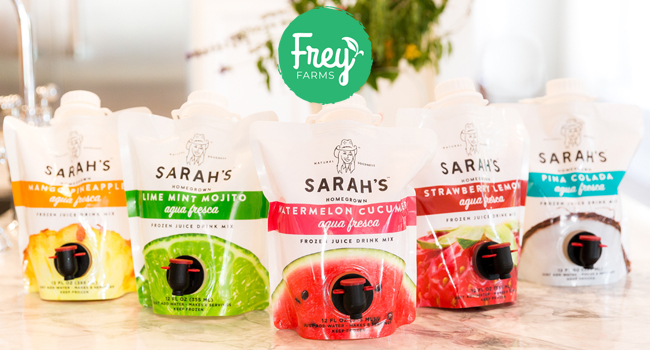 Speaking with BevNET, Frey said she had been producing similar products to the agua fresca line in fountain drink format for private label customers for several years and watching how consumers embraced natural, better-for-you products, she saw an opportunity to introduce the Sarah’s Homegrown line as a way to grow farm-sourced beverages in mass market retailers. As well, Frey wanted the line to serve “a higher purpose” of reducing food waste by using fresh produce and drive down the retail price to make the products accessible to low-income consumers. Frey said she believes agua frescas are an on-trend category that is heading toward the mainstream thanks to its positioning as an alternative to CSDs. She cited leadership in this change by food service chain restaurants such as Panera Bread, Pret-a-Manger, and Chipotle moving away from major soda brands and toward working with companies like Frey Farms to create custom blend better-for-you beverage options. Subway, which purchases agua fresca products from Frey Farms, has similarly put healthier beverage options at the forefront of its stores with its Fresh Pour Beverage Stations. While the first line of Sarah’s Homegrown products are frozen, Frey said RTD products will be launched under the brand name in January at select retailers during category resets. Among the target consumers will be parents looking for healthier drink options for their kids. She noted the RTD line will largely focus on agua frescas but innovation will also “go beyond” that category. In addition to Sarah’s Homegrown, Frey Farms also produces Tsamma Watermelon Juice, a line of cold-pressed watermelon juices and juice blends in 12 oz bottles that also emphasizes its role in reducing food waste by using the company’s own watermelon supply. Frey said the brand is continuing to grow as the company puts more attention on its beverage division.